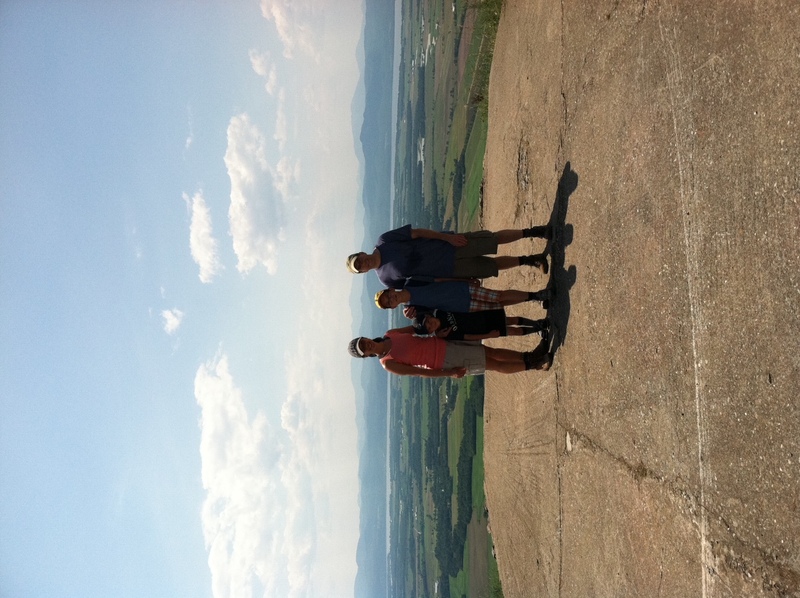 The OINKdaddy and I took Small and Large hiking on Snake Mountain – a 1.8 mile trail in Addison, Vt. – mainly because we had been promised a beautiful vista at the top. I don’t see the point in hiking if there’s no reward. Large tells me that I should appreciate “the journey” but it’s not in my nature. I’m all about the destination. In spite of its name, we didn’t expect to actually see any snakes on the trail so when we did, it was like a special nature lover’s bonus: “Look kids – a garter snake! You can tell because it’s black with yellow stripes.” I encouraged the boys, including the OINKdaddy, to catch it (hells if I was going to do it myself!) but they weren’t fast enough. It was pretty obvious that none of us really wanted to catch the snake but since I don’t want Small and Large growing up afraid of snakes, I used the opportunity to share what little I know about snakes: 1) Poisonous snakes don’t live in northern Vermont, 2) The only venomous snake in Vermont is the Timber Rattler, which is brown, and 3) When you pick up a snake, you should grab it just behind its head. It took us an hour, but we made it to the top where the view was simply stunning. We ate peanut butter and jelly sandwiches and nibbled gorp all the while enjoying a steady breeze and each others’ company. The return trip was a little less fun in that all of us were somewhat tired and Small was very so, and yet even when I was lugging 48 lbs of five year old I felt contented. “Stop messing around!” I yelled back, grinning a little. What a jokester. My smile dimmed immediately when I realized he wasn’t joking. Ahh, the irony of returning from a lovely hike on Snake Mountain to find a large brown snake I have never seen the likes of before almost inside my house! I’m not afraid of snakes per se, but I wouldn’t choose to cuddle with one either. I’m pretty sure the OINKdaddy feels the same or thereabouts. Together, we stared at the cold-blooded vermin as it coiled and uncoiled next to the sidewalk chalk. In that moment not one, single educational thought went through my head. “Get rid of it!” I said. Now, the OINKdaddy’s a catch and release kind of guy while I’m more of a killer. In the fifteen years that we’ve been together, this not-so-subtle difference has been the genesis for more than a few healthy discussions. Live and let live is his motto, while mine is more like sometimes a round-headed shovel is a good problem solver. What can I say? Opposites attract. “Maybe I can scoop it up,” he mused. “What could I use?” He cast around for an appropriate scooping device. 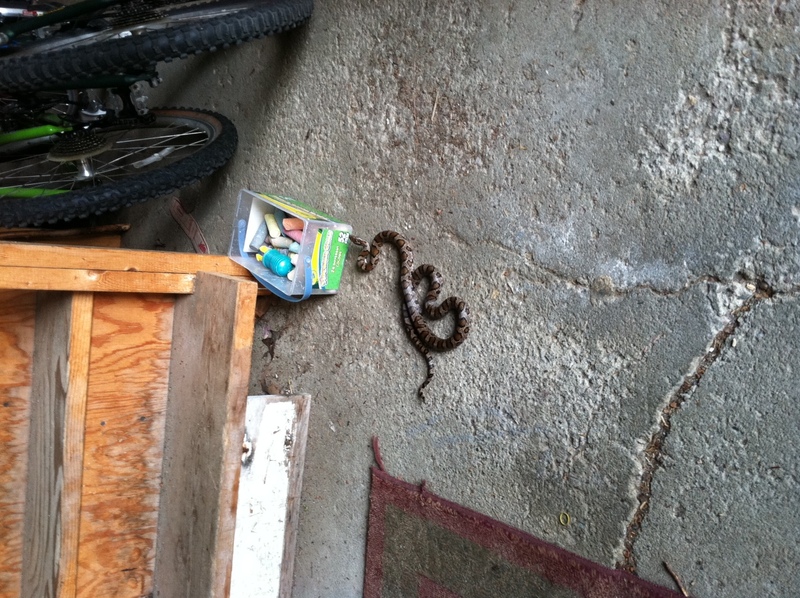 I imagined the thing slithering off into the dark recesses of the garage, safe from the threat of either relocation or death. I pictured it striking an unsuspecting ankle or an inquisitive hand. This was not a moth or a spider or a chipmunk. This was a big, brown snake and I did NOT want it anywhere near me or my kids. So, I did the only thing I could do – what any mother would do. I went after the snake. Upon realizing that the children were becoming more scared of the unholy scene their mother was making than they were by the sight of the actual snake, OINKdaddy grabbed the shovel and stunned the thing with a good whack. I reached for the spade before it could get away and with one slice, it was done. Except it wasn’t. The damn thing did what I’ve seen chickens do after their heads have been cut off (I swear I do not have a secret hobby of killing small animals. My friend’s father raised chickens for their meat when I was growing up and I was at her house on chicken killing day. I was assigned the task of feather plucking – a smelly, messy job if ever there was one.). The headless body writhed and coiled and twitched while next to it, the disembodied head continued to thrust its forked tongue (I never saw the chicken heads move; this must be something particular to snakes). I shrieked, the kids shrieked and the OINKdaddy, well, he was convinced that the snake was still alive. This horror show went on for a good five minutes while the OINKdaddy and I argued whether to cut the snake into smaller pieces (my idea) or to drown the headless body (his idea). Eventually, the snake did us all a favor and finally looked dead. Would Indiana Jones have said this? I think not. P.S. If you can identify this snake, please do so. I believe it is a milksnake which is a common snake, not protected. Cross your fingers! I agree with your field identification of milksnake (the thought of you in jail prompted me to help you). Although I can’t tell from the, ahem, photo if there’s a Y shape on the back of its head? Wow. 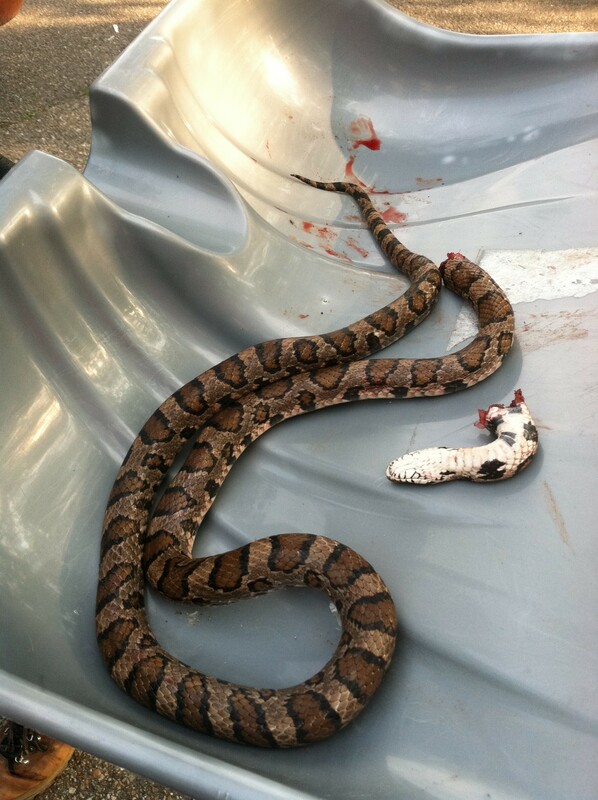 Way to go, killing a snake that posed absolutely no harm to you or your family. At least now the mice are safe. I am evidently pretty grouchy early in the morning and I apologize for not choosing my words more carefully. I understand the panic thing. I just hate to see “kill it!” as the response to visits from snakes and other critters. This won’t sound right either, but I’m glad you feel bad about it. On the other hand, except for the part where the snake died, I enjoyed the way you told the story. I’ll be poking around your blog, reading more. OH YUCKKKK. That last picture will haunt me, maybe forever. True dat. It’s not for the faint-hearted. Maybe I should put a cautionary warning at the top of the page? “The pictures you are about to see…” Lesson learned: do not post under the influence of adrenaline. Next time shovel the snake into a cardboard box and relocate it. I did that several times in suburban NJ when the garage seemed to be the favored vacation spot for local small (non-poisonous) snakes. Could’ve done without the picture. I’d like to think I wouldn’t have been as freaked out if it had been a small snake but this sucker was BIG. Today’s a new day, fresh, with no mistakes in it. With my luck, I’ll get a second chance. My dad is a country vet in rural PA who used who have a whole mess of snakes in his office to try to show people how cool snakes are and that they’re good for the environment and should be allowed to keep their heads. So technically I was raised in a pro-snake environment. Although in all fairness I have not faced a live snake in my home (my live and let live policy doesn’t generally include my own personal domicile). My mother is absolutely terrified of snakes to the point where she’d joke that if she saw one on the road when she was driving all four tires would lift off the ground. 🙂 It was a funny scene (not for the snake, of course) because I’d much rather laugh than cry! I had the pleasure of walking into “The Lodge” and being invited to listen as your Mom and “Medium” read the snake story… VERY animated reading!!! I don’t think your Mom will ever step foot in your garage again!!! Uh-oh. Guess all grandchildren-sitting will take place at her place from now on! This was one of those days that will live on in infamy – my family will never forget it and neither will I! « Holy Smokes Batman, I’m Published!